← In September, U.S. inflation was … well, what was it? 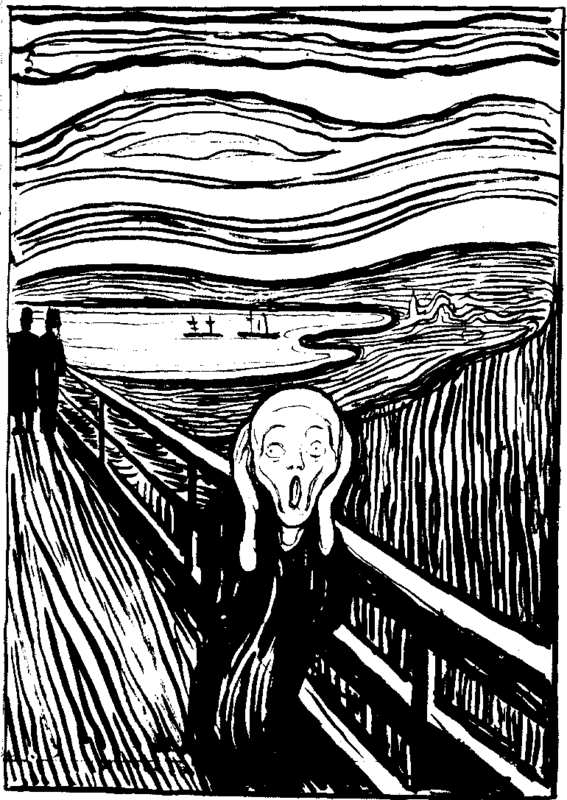 Edvard Munch painted four versions of The Scream, plus the lithograph shown above. One of the side effects of the U.S. government fiscal circus of the last few weeks is that Federal Reserve officials must be sitting on the sidelines, mouths open in horror. Sort of like Edvard Munch’s famous paintings and lithographs. What are they doing? So, today, the Wall Street Journal’s ‘Heard of the Street’ column (‘Shutting the Fed’s Taper Plans‘) confidently predicted a complete shutdown of taper talk until the federal government comes up with some sort of consensus on the budget and debt limit. Up until Sept. 19, the markets had been betting the Federal Reserve would begin a gradual tapering of its bond-buying economic stimulus program. But on that day, the Fed decided to put taper on hold. That was probably a wise move, given the huge disruptions this month caused by the government shutdown and debt-ceiling brinksmanship. If the numbers look good, Fed policy makers at their December meeting might feel justified in scaling back the central bank’s bond-buying program. But that would ignore one crucial consideration: With the budget deal funding federal agencies only through Jan. 15, and raising the debt ceiling only through Feb. 7, another battle could be brewing. What does this mean for holders and buyers of Treasury Inflation-Protected Securities? I think we can see yields lingering in this current range, around 0.40% for a 10-year TIPS and 1.35% for a 30-year TIPS, well into next year. Yields have fallen more than 50 basis points since an early-September peak. We probably won’t get that 50 back in the near term, and I don’t think we’ll see much of a fall from here, if the economy remains stable.